ways( with contemporary music, video, drama and other media), to keep them once they come. Relationships are critical to christian maturity, and the next step of maturity is to learn to love others in the body. As a result, our next step is small group. The tool used to help position people in life groups is Mizizi, an experience designed so that close relationships will be built in small intimate groups that meet weekly. HATUA- Raising Your Faith to Relevance. Service in the church is just a step to prepare believers to impact every sector of society. 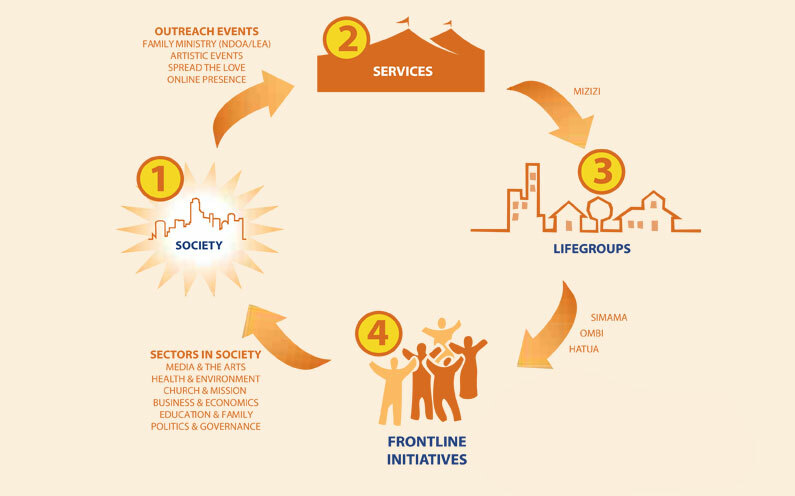 At Mavuno, we have defined six sector of society that we’d like to impact, and we help members discern which area of society God is calling them to influence. We encourage them to start frontline initiative which are institutions that can impact society in one of our six sectors.